In 1910, President Theodore Roosevelt proclaimed Grandview Drive to be the “world’s most beautiful drive.” That was just one of the Peoria fun facts we learned about the city’s history on the narrated River City Tour conducted by the Peoria Historical Society. Peoria Heights was once the bicycle center of the United States. In the early 1900s, up to 40,000 bicycles per year were manufactured in Peoria Heights. In addition, the Peoria Bicycle Club was the largest bicycle club in the United States, and annual bicycle races were held here. The Heights Tower is a water tower. 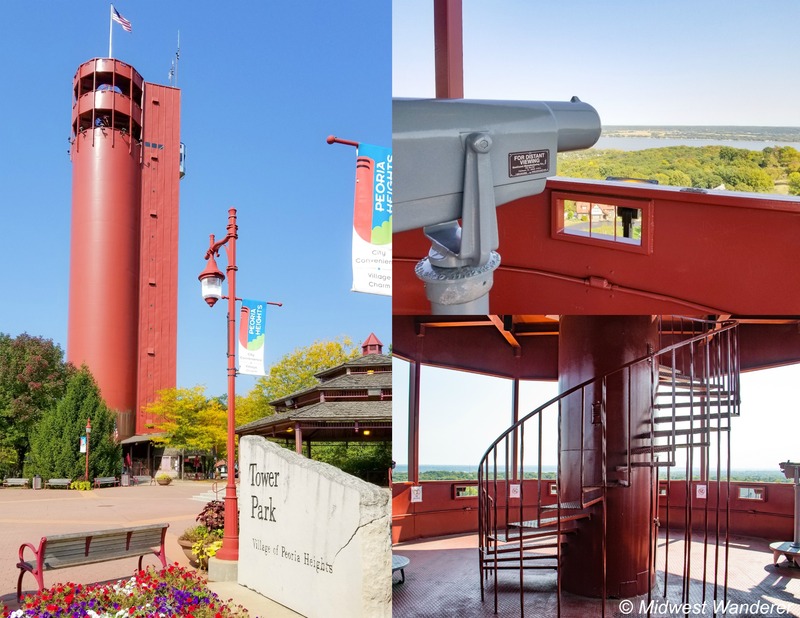 You can ride an elevator up the 200 foot Heights Tower to the observation deck for an expansive view of the Illinois River Valley. What you wouldn’t know just by looking at it is that the tower is an in-use water tower, holding 500,000 gallons of water. 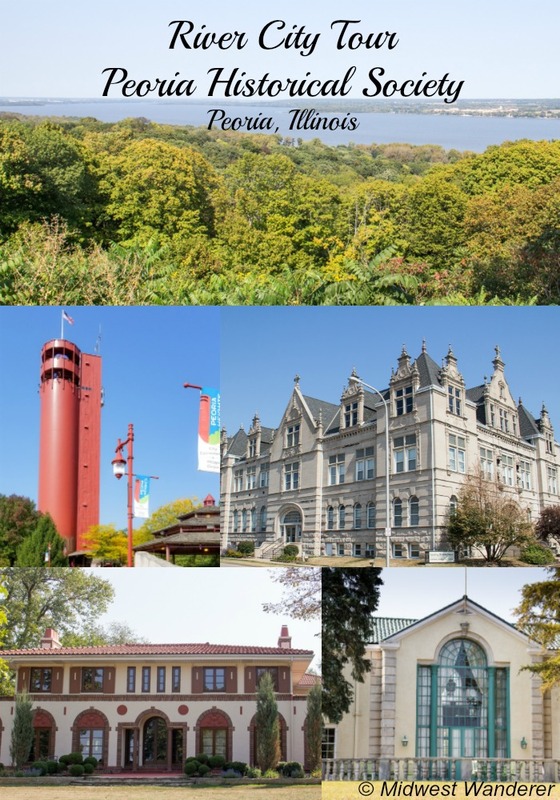 The Peoria Park District, the second-oldest park district in Illinois, dates back to 1902. One of the first thigs the park district did was to build what they called a pleasure parkway, a drive along an Illinois River bluff. To this day, the park district owns and maintains Grandview Drive, the actual street. 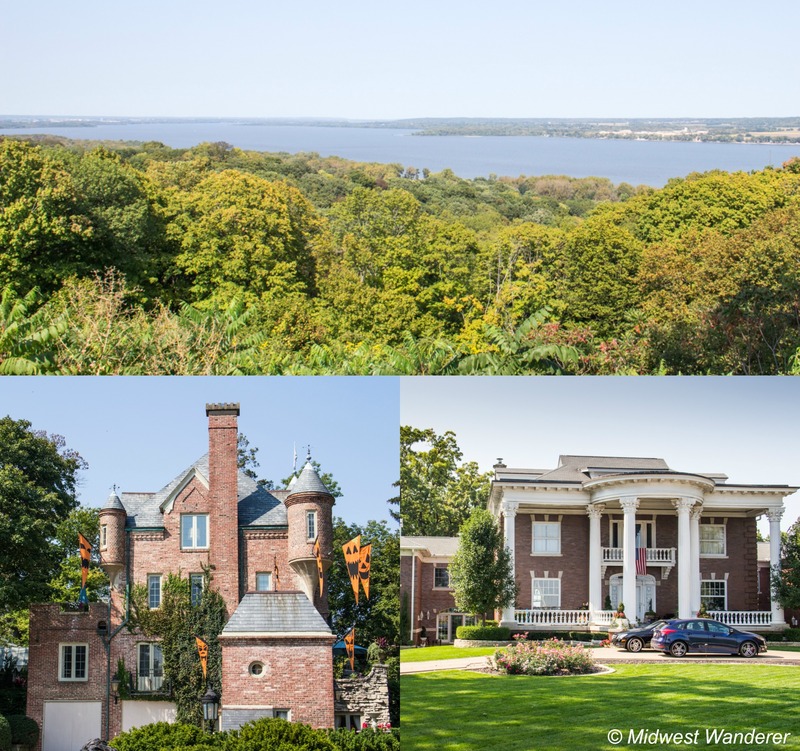 The drive is lined with stately mansions on one side and a park overlooking the Illinois River on the other. Bernie pointed out several mansions built in the 1920s and some of the stories behind them. One story is that one homeowner built his daughter and son-in-law a house next door to his own as a wedding gift. The daughter had been to Europe and fell in love with castles. So they had the house built to look like a castle, complete with moat. The moat existed until the 1940s. Top: View of the Illinois River from Grandview Drive. Bottom: left, castle home decorated for Halloween; right, the current owners of this mansion restored the home to its original splendor and added a wing on each side. As we were riding through some of the more historic parts of Peoria, Bernie gave us a brief history of the city. The French settled here in 1690, when it was part of New France. Although it became British territory during the Revolutionary War, the French stayed. However, during the War of 1812, the territorial governor thought the French were siding with the British, so he set up a flotilla to check. The flotilla commander thought they were being attacked (but they weren’t), so they burned down the French village. The government then built a fort there. So although there are older settlements in Illinois, Peoria is the oldest continuously occupied settlement. In the 1880s most women didn’t go to high school, let alone college. Instead, women’s clubs gave women extra education—in subjects like the arts, sewing, and baking. Most of those clubs are gone today, but the Peoria club still exists. Through the years the Peoria Women’s Club changed its focus to civic affairs. Members still meet regularly. The city keeps an inventory of sandstone. The 1890 Peoria City Hall is built of sandstone. Because the quarry from which the sandstone came no longer exists, the city has purchased some from houses that were torn down in the area. The city keeps the sandstone in case repairs are needed to the City Hall building. Peoria was the distilling capital of the world. In 1846, steamboat captain Almiron Cole built a distillery in Peoria. By 1880, Peoria was the distilling capital of the world, with twelve distilleries located along the Illinois River. Kentucky had far more distilleries, about two hundred, and manufactured about 15 million proof gallons of alcohol. However, the twelve Peoria distilleries produced 18 million proof gallons of alcohol. The reason Peoria was so popular for distilling was the water. Beneath the Peoria bluffs was a limestone aquifer, and limestone water was considered the best for the distilling process. The golden era of distilling died in 1920 with Prohibition. Only one distillery was allowed to remain open to make industrial alcohol. After Prohibition ended, Canadian company Hiram Walker opened a distillery in Peoria, to they could produce bourbon. One of the requirements for a whiskey to be called bourbon is that it must be made in the United States. In 1933, the distillery was the largest in the world. Hiram Walker remained in Peoria until 1982. Archer Daniels Midland then purchased the plant, continued to make alcohol for some time, then converted it to an ethanol plant. Richard Pryor was born and raised in Peoria. Richard Pryor, the late comedian, grew up in Peoria. His grandmother raised him in a brothel that she ran. Pryor returned to Peoria to film the movie Jo Jo Dancer, Your Life is Calling. 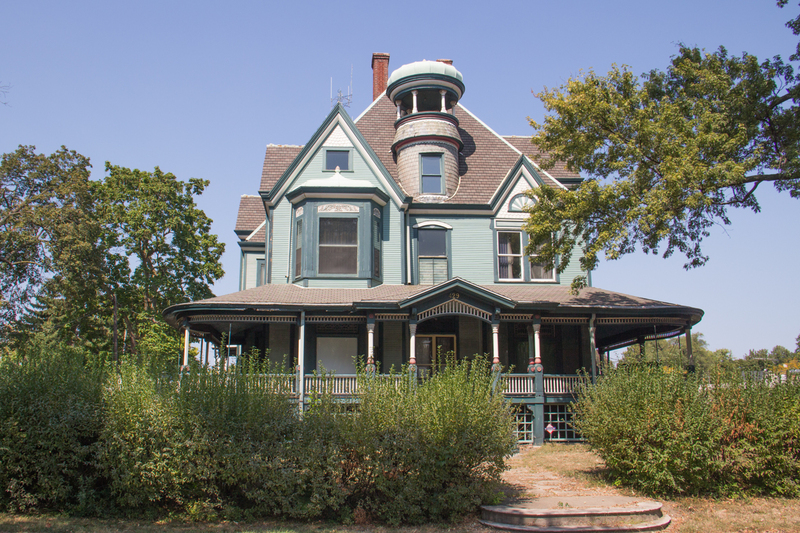 Since the home he was raised in had been torn down, the movie folks found a similar Peoria home to use in the film and painted it green, the color of the brothel. In 1900, Peoria was huge on the Vaudeville circuit. There were fifteen theaters in downtown Peoria. With such fierce competition, Vaudeville acts knew that if they were successful in Peoria, they’d be successful in bigger cities like Chicago or Philadelphia. That’s where the saying “Will it play in Peoria?” comes from. Besides these Peoria fun facts we learned on the River City Tour, Bernie emphasized a lot of the architecture of historic homes and buildings, as well as the city’s history and stories of fascinating people who made Peoria their home. The Peoria Historical Society offers several tours besides the River City Tour, including haunted tours in September and October. Visit the Peoria Historical Society website for detailed information.